For centuries, the honeybee has played an essential role in the maintenance of ecosystems around the world. The hard working little creatures pollinate crops such as potatoes, onions, celery, mustard, broccoli, cauliflower, cabbage, brussel sprouts, cucumber, squash and carrots, to name a few. Honey bees alone are responsible for 1 of every 3 bites of food you eat per day. Pollinating food for humans is only a small portion of, arguably, the most difficult and important job in the world. Honey bees are responsible for pollinating the plants that feed birds and small mammals as well. Without small mammals, the larger predatory wildlife could not survive. It is safe to say that the survival of mankind and many other species is inextricably linked to bees. Unfortunately, the honey bee is quickly becoming the world’s, “Canary in the coal mine,” as stated by the Obama administration. The bees aren’t only dying, they are disappearing. They begin to act oddly, going queenless or attempting to make more than one queen. Beekeepers first noticed the phenomenon, now known as Colony Collapse Disorder, or CCD, in 2006; since then 10 million bees have been lost. In 2014, 40 percent of honey bees were lost, and more were lost in the summer, when bees typically thrive, than any year before. 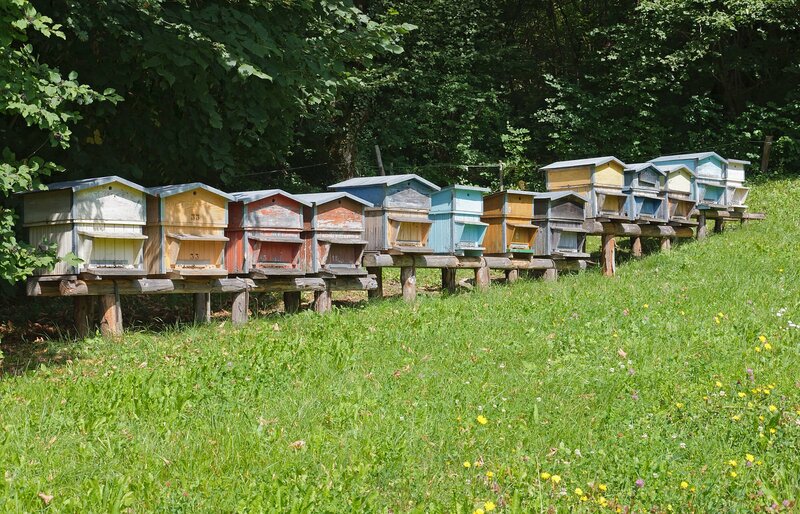 The total cost of CCD to beekeepers nationwide totals $2 billion. Scientists can’t agree on a single reason for the devastating loss of the honey bee, but it appears that the biggest culprit is a relatively new pesticide called neonicotinoids. Imidacloprid is the most prominent of the neonicotinoids. Studies show that this pesticide causes a loss of cognitive function in bees, including their ability to navigate home. Neonicotinoids were developed in 1985, but were not widely used until the early 2000’s. These pesticides are not sprayed on the fields like pesticides in the past, they are coated onto the seeds of potential crops, and then absorbed by the plant, making the plant itself poisonous. When insecticides are distributed in this way it takes years for them to get out of the earth around where the seeds were planted. Today, nearly every modified corn seed and one third of soybeans planted in America are coated with a neonicotinoid. The chief bee researcher at Bayer CropScience, David Fischer, argues the harm the company’s product ‘might’ be doing to bees by stating, “The basic principle of toxicology and risk assessment is ‘the dose makes the poison, or to put it another way, all substances are toxic, but what differentiates a poison from a remedy is the dose.” Syngenta is another major producer of neonicotinoids, Jay Overmyer, lead of Syngenta’s Ecological Risk Assessment states, “I don’t think we can deny that if a bee is exposed to pesticide, there’s not stress there. But it all goes back to the fact that there are multiple stressors, and they all have to be taken into consideration.” There are multiple stressors such as habitat loss, which affects all wildlife, and the practice of migratory beekeeping, where bees are trucked in to pollinate mega-crops. Bees’ natural habitat is not the back of a semi truck, but this system has been in place in our country for decades. It is difficult to argue that a poison made to kill insects would not effectively kill insects, which is what bees are, afterall. It’s also a striking coincidence that neonicotinoids and CCD both made their debuts at precisely the same time. No one would argue with the fact that our lives depend on the honeybee, even the producers and the users of neonicotinoids lives depend on them, so why take the chance?